Snapping Facade explores a sustainable design strategy that utilizes elastic instability to create dynamic motion at the building envelope. The current dynamic shading systems adopt either glass enhancement or motorized mechanical movement. This study introduces snapping-induced motion as an alternative actuation mechanism to control apertures, and proposes Snapping Facade as a new dynamic shading system. Based on analytical and numerical study, the researchers fabricated the assembly of a prototype snapping facade and validated the hand-operated snapping motion. The proposed snapping facade suggests a novel way to recycle the strain energy stored in structures via elastic instability. Project engineer: Jongmin Shim Research team: William Baptiste, Jing Jiang, Hakcheol Seo, Andrew Koudlai Honorable Mention Project: The Framework Project Architect: Lever Architecture with the Framework Project Location: Portland, Oregon Framework is a 90,000-square-foot, 12-story project that is slated to become the first wood high-rise in the U.S. Approval for the project required 40 tests to demonstrate mass timber’s fire, structural, and seismic safety. The testing data will be made public to support a regulatory path for high-rise wood structures and encourage wider adoption of mass timber in the U.S.
Sean McKeever, a senior associate at NBBJ, works between architecture and energy modeling in the firm’s corporate and digital practice studios. "One of the things I appreciate the most about architecture is not its static state. I love to see a building that is clearly 'living' with its occupants. There's beauty in letting users have a certain amount of control over the building." In response to a growing desire for clients to produce more user control over their workplace, McKeever and his colleagues have released multiple apps for smartphones and a prototype for a smartphone-controlled facade-shading device. The prototype, called Sunbreak, is a responsive system of louvers that raise and lower dependent upon solar radiation, temperature, and user override variables. The project has its roots in the Seattle office, which is one of the first buildings in the country to integrate automated exterior blinds that raise and lower with pre-programmed sun paths throughout the day. Although these sunshades have been a popular feature from the start, they block employees’ views when deployed, inspiring the firm to improve them. McKeever attributes this to a lack of user control and the fact that the blinds operate without regard to radiation data. Sunbreak runs off of pyranometers—sensors measuring solar radiation and infrared light. When shading is not needed, the panelized system folds up to, in McKeever’s words, “hide from view,” while performing as a light shelf to direct daylight further into the building. The modular shades feature narrow slats that operate along vertically oriented tracks. 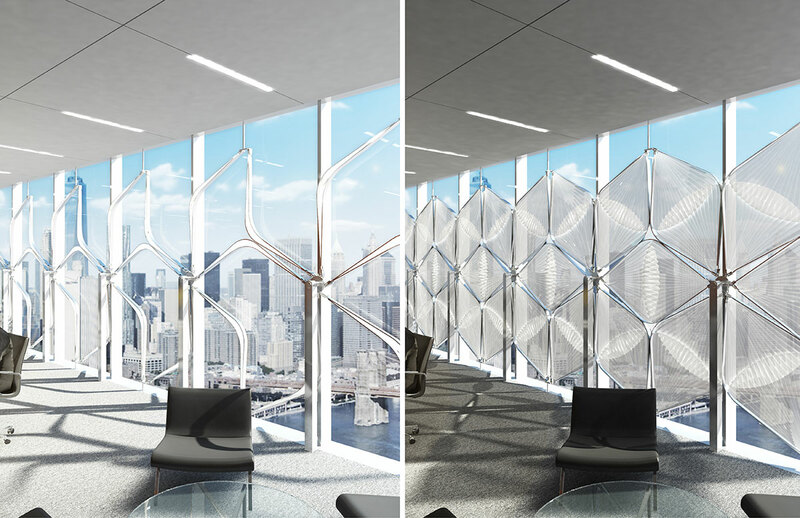 As the system contracts, individual panels fan out to form curvilinear shapes, which NBBJ’s team has fine-tuned to produce optimum shading responses throughout the diurnal cycle. The project is panelized so that individual units can be controlled by a smartphone app, allowing authorized users to operate the shades in real time. Since Sunbreak was developed, user-control and responsiveness to sensored data has extended beyond the facade to the interior workplace. "The user-driven ultra-controllable workplace is the desirable workplace of the future and present.” In response, NBBJ’s Digital Practice group has developed an app called Goldilocks that utilizes real-time data to track acoustics, temperature, daylighting, and activity within open office environments, giving employees the option to find an ideal working environment for their current tasks. 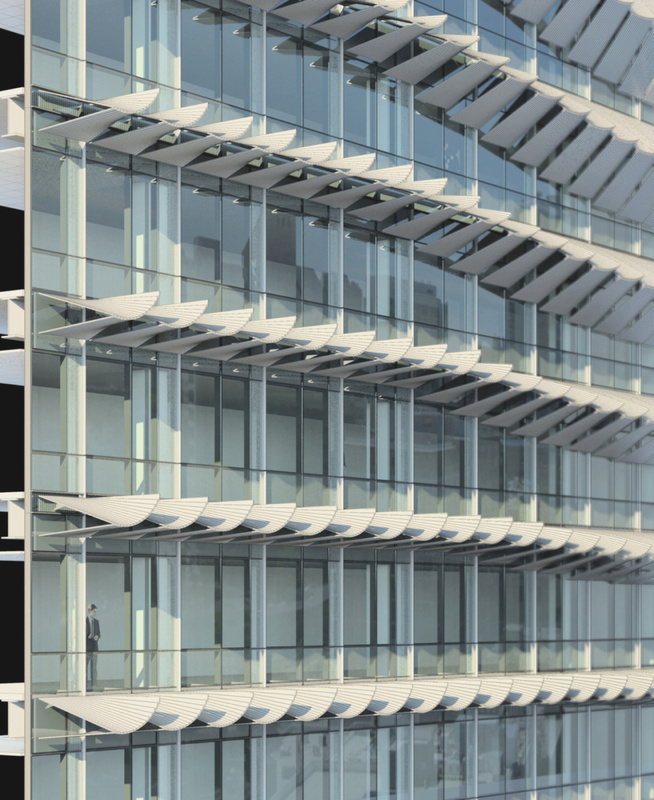 McKeever believes facade projects are more challenging to implement for the industry due to their complexity: "I think dynamic facades are still in a ‘prototyping’ phase for much of the industry. To deliver a project of this ambition at full-scale you need collaborative partnerships among teams of specialists and capital investment… I'm excited where the industry is going, but it feels like we can't get there fast enough!"